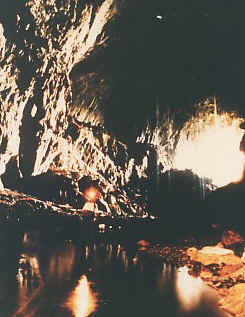 Gunung Mulu is Sarawak's largest national Park and the site of one of the world's greatest cave systems. It features the world's largest cave passage, the largest natural chamber, the longest cave in Southeast Asia and fascinating as its world-famous caves. Mulu's bio-diversity is as impressive as its world-famous cave. For example, the park contains 8 different forest types, thousands of species of ferns, fungi and flowering plants, 75 species of mammal and 262 species of birds. The four show caves at Mulu can be easily visited as day trips from the park headquarters. 14:00 Transfer to Park HQ, register then trek for about 3km through Mulu's amazing tropical rainforest to Deer Cave, the largest cave passage in the world. Discover Lang Cave and it beautiful formation. Relax with a snack at the open-air observatory for an opportunity to witness the phenomenon exodus of bats out of the Deer caves, spiraling high overhead and ascend to the sky where they will search for food. 14:00 Transfer to Park HQ, register then trek for about 3 km through Mulu's amazing tropical rainforest to Deer Cave, the largest cave passage in the world. Discover Lang Cave and it beautiful formation. Relax with a snack at the open-air observatory for an opportunity to witness the phenomenon exodus of bats out of the Deer caves, spiraling high overhead and ascend to the sky where they will search for food. Breakfast, by longboat to Penan Settlement. Bargain for souvenirs or just listen to this one nomadic tribes of Sarawak regale you with fascinating stories of headhunters, tribe's wars, and witchcraft and folklore tales. Enroute to Wind Cave & Clearwater cave. After visiting both caves, have a picnic lunch at Clearwater pavilion. Continue your journey by longboat to Kuala Berar then trek 7.8 km (2 - 3 hours) through beautiful rainforest along the Litut River to Melinau Camp (Camp 5). Dinner and overnight at Camp 5. Breakfast, commence a 3 - 4 hours ascend of gunung Api to see razor-edge Pinnacles from the Peak. 21/2 hours up hill and 1 1/2 hours by ropes and ladders to viewpoint overlooking Pinnacles. Lunch at the peak before descend back to Camp 5. Breakfast, trekking back to Kuala Litut then onward by longboat down to Mulu airport for departure flight. Deer Cave is reached by following a 3 km plank walk which passes through peat swamp, alluvial flats and limestone outcrops. There is much to see on the way to the cave, including some superb rainforest, jungle streams and an ancient Penan burial cave. Deer Cave is a world largest passage cave with over 2 km in length and 90 metres high and wide. It also home to many species of bats. Between 5 - 7 pm, if the weather is fine, visitors may be treated to the spectacular sight of black cloud of thousands free-tailed bats emerging from the entrance of the cave to go in search of food. A visit to Deer Cave is usually combined with Lang Cave, which the entrance is a short distance away from the Deer Cave. Lang Cave is the smallest of the show caves but its rock formations are well worth seeing. These are made all the more attractive by the strategically positioned spotlights which highlight stalactites and stalagmites. Clearwater Cave is Asia's longest cave, measuring some 107 km. It can be reach by longboat along the Melinau River with stop over at the Wind Cave along the way. It normally takes about 15 minutes to reach Wind Cave by boat. When the water level is low the journey takes longer. A plankwalk leads from the riverbank to the entrance of Wind Cave, so named because of the cool breezes which can be felt at the narrow parts of the cave. Wind cave, which is part of the Clearwater Cave system, has many impressive stalactites and stalagmites. From Wind Cave to the Clearwater Cave entrance is about 5 minutes by longboat. 200 steps lead up through the forest to the mount of Clearwater Cave. With its underground river, Clearwater is a fascinating cave to stroll around. 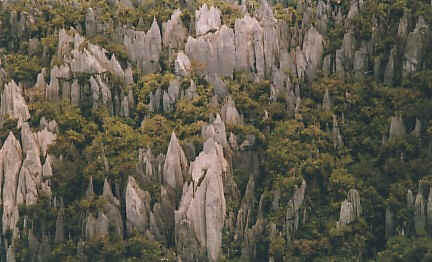 The Famous Pinnacles at Mulu consist of a series of 45 metre high, razor-sharp limestone spikes that tower above the surrounding vegetation, mid-way up the slopes of Gunung Api. The first stage of the trek is a 1-2 hour boat trip along the Melinau River to Kuala Berar. If the water level is low, the boat has to be pushed over rocky sections so the trip takes longer. Base Camp 5 is a relatively easy 7.8 km walk from Kuala Berar, following flat jungle terrain and taking 2-3 hours. The real hiking begins the following morning. The trail is 2.4 km in length but rises some 1,200 metres from Camp 5 to the viewpoint, passing through lowland dipterocarp forest before climbing steeply through moss forest. Here the trees are a lot smaller and everything is covered in slippery green moss. The last section of the trail is near vertical, with rope sections and 15 aluminium ladders strategically positioned to help with the climb. Usually for fit and experienced trekkers should be able to reach the top in 2-3 hours. The not so fit but determined generally take around 4-5 hours. Most people spend an hour or at the top before coming down. The descent is actually more difficult and therefore takes longer, so the return trip can take anything form 5 to 10 hours depending on fitness level. The Headhunter's Trail is a great way of entering or leaving Gunung Mulu National Park. This trail is follow the route taken by Kayan headhunting parties who paddled up the Melinau River to the Melinau Gorge. They then dragged their longboats through the forest for 3 km until they reached the banks of the Terikan River, where they launched headhunting raids against the people of the Limbang area. The first stage of the trek is same as Pinnacles Trail for Day 2 and Day 3. On Day 4 from Camp 5 follow the 11.3 km trail to Kuala Terikan, a 4-5 hours trek. Transfer by boat for about 15 minutes to Mentawai HQ for lunch. Then travel by boat to Kuala Mendalam Iban Longhouse for overnight. On Day 5 continue journey by boat to Nanga Medamit then travel by road to limbang. Item to bring: rain coat, swim wears, trekking shoes with good grip, water bottle, insect repellent, sweater and sleeping bag for pinnacles tour.